A 40-foot-wide depression opened between two homes late Tuesday night in New Port Richey, Florida. The hole, which measured approximately 40-feet-wide and 20-feet-deep, opened between two homes in the gated River Ridge Subdivision community, the Pasco County Fire Rescue reported. Both homes were unoccupied when the hole opened, authorities said. Pasco County Fire Rescue said half of the depression is located underneath one of the homes. Pasco County Building Inspections declared both homes to be unsafe. Authorities initially noted that no other homes are in danger and said the depression is not affecting the middle school and high school located nearby, WTSP reported. However, Kevin Guthrie, the assistant county administrator for public safety, told reporters that other homes will likely be affected. The two families declined help from the American Red Cross and are reportedly seeking alternate shelters. The families were told to contact their insurance companies because the hole is on private property. Nothing in the home shifted after the hole opened up and the structural integrity of the home appears to be intact, officials said. Pasco County Fire Rescue, Emergency Management, Building Inspections and a Deputy Building Official responded to the scene, officials said. The New Port Richey hole has not been classified as a sinkhole, WTSP noted. According to the USGS, a sinkhole is a depression that does not have any natural external surface drainage. 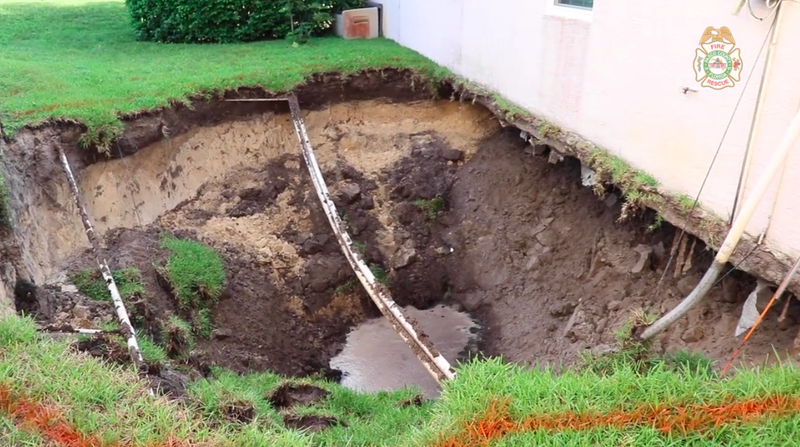 In May, at least a dozen sinkholes were reported in Ocala, Florida. The sinkholes reportedly began opening up in the Fore Ranch community as early as April 25, the Washington Post reported. Several vehicles were swallowed up but no one was injured, according to local reports.